Eighteen people died in New York City traffic in February, and 3,770 were injured, according to Mayor de Blasio’s Vision Zero View crash data map. 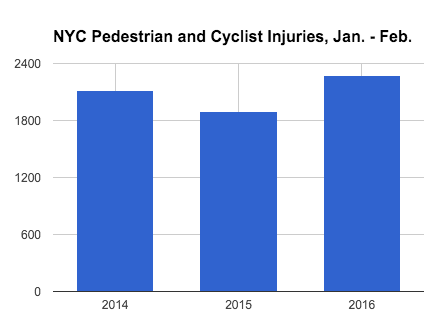 As of the end of February, the city reported 26 pedestrians and cyclists killed by city motorists this year, and 2,277 injured, compared to 21 deaths and 1,896 injuries for the same period in 2015. Motorists killed at least two seniors in February: Dorothy Heimann, 90; and Carol Dauplaise, 77. Across the city, 1,008 pedestrians and 183 cyclists were reported hurt in collisions with motor vehicles. Per NYPD policy, few of these crashes were investigated by trained officers. Of 12 fatal crashes on surface streets reported by Streetsblog and other outlets, three motorists were known to have been summonsed or charged criminally for causing a death. Based on NYPD and media accounts, at least five victims were believed or known to have had the right of way when they were struck. The truck driver who killed Elise Lachowyn outside the Javits Center was charged under the Right of Way Law. The livery cab driver who hit Carol Dauplaise in Midtown was charged with failure to yield and careless driving. The woman who killed cyclist Stanley Marshall in Staten Island was charged with manslaughter and impaired driving. Gwendolyn Booker was struck by a school bus driver on a sidewalk in Brooklyn. Police and District Attorney Ken Thompson filed no charges. Dorothy Heimann and Maria Minchala were hit by turning drivers at intersections in Brooklyn and Manhattan, respectively. No charges were reported filed for either crash. Alexa Smith, 16, was killed on a street in Queens with a 40 miles per hour speed limit by a dollar van driver who left the scene. Jose Contreras, Besik Shengelia, and an unnamed male pedestrian were killed on the same night by hit-and-run drivers in the Bronx, Queens, and Brooklyn. Five motor vehicle occupants died in the city in February, according to the mayor’s office, and 2,579 were injured. Could the mild winter have fueled this increase? Lady killed by sanitation truck making a turn and not yielding on the UES this morning. NYPD: “driver stayed on scene, no charges expected.” Vision Zero, as I 100% predicted, is a complete and utter washout and was always going to be as long as no attempt was made to reform the NYPD and DA’s office – both of which are institutionally incapable of doing the jobs which justify their existence (and taxpayer funding). De Blasio has not said one thing about this dysfunction let alone made any attempt to correct it. A fully functional NYPD could have hit this driver with a slew of charges including failure to yield and involuntary manslaughter, but instead they just shrugged their shoulders and let him get away with homicide as they ALWAYS do. If it had been an officer in that crosswalk, he would be facing manslaughter charges by now. Civilian pedestrian lives just don’t count. The NYPD won’t do their job. The DOT can only work so fast. Here’s a different idea: require drivers in NYS to carry liability insurance that is UNCAPPED for medical liabilities. Now, I don’t know of a cop killed by a sober (or drunk) driver, so I can’t speak to that. But in general people outside of vehicles are considered equally worthless with or without a badge. I was thinking the same thing. Last year I didn’t ride my bike at all until April. This year I’ve ridden five times. The weather was actually conducive to a lot more riding than that, but January/February were really busy months. Here’s a better idea: remove the immunity of DAs and the NYPD from lawsuits. Make them personally liable for failure to prosecute strict-liability offenses given evidence. If they refuse to do their job, they need to be liable for it. Also, make it illegal for the city to spend city money defending the DAs or the NYPD from lawsuits. The only way these numbers will ever come down significantly is to have exclusive walk signals at all intersections. That is until all vehicles are driverless. That includes food delivery bicycles! Our accounting of New York City pedestrians and cyclists known to have lost their lives to motorists in 2016.